We spoke with an EA rep at Comic Con to get some details about the upcoming downloadable shooter. TheGameReviews: So Battlefield 1943 was just announced last week. Is this mostly a remake of 1942 or does it offer any changes to the original? 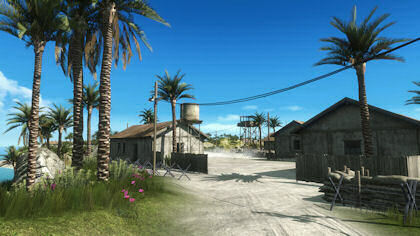 EA: It uses some of 1942’s maps: Wake Island, Water Canal, and Iwo Jima. It’s kind of a condensed version of the original. TGR: Are there only three maps in the game or will more be announced later? EA: There are only three maps as it is a downloadable game. TGR: Was the 3 maps decision made based on the fact that it’s downloadable, or based more on the same creed that Battlefield Heroes was created under. I remember hearing DICE talk about how there are a ton of maps that rarely get played in many games while one or two of the maps become huge and populate every server, which is why Heroes has a small map count. EA: We followed a similar strategy for 1943, yes. TGR: Are the included maps are direct ports or more reimaginings of their 1942 versions? EA: The maps are a little more condensed than they were in 1942 PC, mostly due to the limitations of the console. The game is now 12 on 12, 2 sides with 3 classes each. TGR: The class system…same as before? EA: We eliminated two of the classes and merged a lot of their parts into the remaining three. There are also shared responsibilities between them. TGR: How many vehicles will be in the game? EA: Planes, tanks, jeeps, and boats will all be featured, but they are different for each side of the fight. TGR: Can you talk about the destructibility in the game a bit. Is it similar to Bad Company, where everything explodes in a very over-the-top manner? EA: It’s built on the Frostbite engine which powered Bad Company, so you will see the same destruction, physics, and great audio that made Bad Company so cool. TGR: The health system is different than it was before? EA: There is no health bar. When you get shot, you see your screen darkening a bit. We don’t want people focusing on finding health packs and such. We just want you to regenerate and keep playing. TGR: Is there any offline botmatch options, or is it online only? TGR: Will there be DLC, more maps, etc? EA: Anything is possible, but we are still trying to determine what we will be doing on the downloadable side. TGR: Any chance of a retail release? When is it coming out? EA: There will be no retail release and it will arrive in summertime. TGR: Thanks for your time.